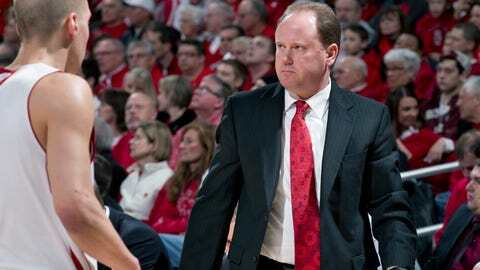 During 13 years in the Big Ten, Wisconsin assistant Greg Gard has earned praise across the league from coaches, who agree he will likely be a stellar head coach some day. MADISON, Wis. — The man whom many regard as the adhesive that holds Wisconsin’s basketball program together is talking about pig manure. And if that sounds far removed from the world of big-time college athletics, well, it is. Except Greg Gard has a story to tell. And when it’s finished, his rise to becoming one of the top assistant coaches in college basketball starts to make a little more sense. Gard, you see, grew up on a small hog farm in Cobb, Wis. (population roughly 400). It was there where Greg, along with brothers Gary and Jeff, first learned the value of responsibility. When their father, Glen, worked Saturdays for a local farm credit loan company, they were assigned chores to complete before he returned home. Sometimes, that meant scraping out hog manure from the stalls. It wasn’t glamorous. But the job needed doing for the good of farm and family. If they missed a spot, they’d be sure to hear about it and be tasked with walking back to the stalls to do it again. "It goes back to pride, discipline, work ethic," Gard says. "Doing things right and taking some personal ownership. When my dad or my grandfather walked into that hog house, if it was as clean as it could be, you could take some pride in that." Attention to detail, Gard learned quickly, mattered more than simply fulfilling the assignment. That’s how the three Gard brothers won multiple showmanship awards at the Iowa County Fair for hog showing. They didn’t just appear with a pig. They spent months feeding it properly, cleaning it, training it. And with the right amount of preparation and detail, they could achieve something special. Otherwise, why bother showing up? "It was emphasized to us even at a young age that you can’t take shortcuts in life and try to get ahead," Jeff Gard says. "It’s always going to catch up to you. You’ve got to put the time in and be willing to do things the right way." Greg has carried these same principles into coaching, scouting and recruiting for 24 years. When he found something he truly loved, he went after it with everything he had. This is how a one-time agricultural business major with no college basketball playing experience filled a void in his life and became the right-hand man to Bo Ryan, one of the most successful coaches in the sport, building an unwavering trust level along the way. Do the best you can. Get out what you put in. Make the most of each day, and the reward will follow. But never overlook the small steps necessary to achieve those goals. If Greg Gard had followed through on the career path he initially chose while a student at the University of Wisconsin-Platteville, he says he’d probably be out selling tractors somewhere, making good on his background in agriculture. But the turning point in his life came as a college sophomore, when he was cut from the baseball team and had no outlet to fuel his competitive drive. That’s when he found a small wanted ad in the local shopping news for an eighth grade boys basketball coach at a school 15 miles south of Platteville. Gard interviewed, got the job and was soon imparting the knowledge he learned as a three-sport athlete at Iowa-Grant High School. He made $800 for the entire season, but he connected with players, understood the game and enjoyed being close to the sport. His teams practiced after school from 3:30-5 p.m., and he soon caught the eye of Jim Nedelcoff, the school district’s varsity coach at Southwestern High. Nedelcoff, a Hall of Famer, was so impressed with Gard’s work ethic that he asked him to help out with the varsity team. And so, Gard would coach the eighth graders, then drive over to the high school and spend a couple more hours teaching on the court. He helped the high school team for the next three years until Nedelcoff retired. And this is about the time when Bo Ryan entered the picture, which put Gard on the coaching track for good. Ryan was the basketball coach at UW-Platteville and had seen Gard working his summer camps as a volunteer throughout college. Ryan approached Gard about helping as a student coach, and he quickly became an invaluable asset — a hard worker who wanted to please, even if it meant performing mundane tasks like scouting and charting practice. Gard switched to an education major so he could teach and coach, never considering the prospect of becoming a Division I assistant. If he wound up coaching at nearby Fennimore High School, he says that would’ve been enough for him. "It started with this is something I really like to do," Gard says. "I wanted to be able to help young kids. You just tried to do a good job and make sure you didn’t screw it up. "Bo’s always had an impact on anybody that’s played for him or worked for him. He’s always a guy you don’t want to disappoint. In terms of work ethic and doing things right and doing your job and doing the best you can for your team, whether it’s your family’s farm or a junior high team or a college team, you pull your weight. Do your thing and try not to disappoint people." Gard took a leap of faith in Ryan, who convinced him to stay at Platteville after he earned his undergraduate degree despite opportunities to serve as an assistant coach at other programs. And in their second season together, in 1994-95, he was rewarded when Platteville finished 31-0 and won the Division III national championship — the first of three titles Gard would win coaching alongside Ryan, who had also won a championship in 1990-91. It proved to be the start of a long climb up the coaching ladder, with Gard following Ryan to his first Division I coaching opportunity at UW-Milwaukee and then on to Wisconsin. They have been together ever since. A thick stack of pages spills from a red folder on Gard’s desk — the scouting report on Michigan days before Wisconsin plays host to the Wolverines in a key early Big Ten game. Gard has spent more than a week preparing the Michigan report, and most of the legwork is already finished. There are hand-written diagrams of Michigan’s favorite plays. Counter numbers of specific moments on tape to pull for scout film. A printout of players’ strengths and weaknesses. Notes on Michigan’s half-court defense, a possible 1-3-1 zone and the dramatic improvement of sophomore guard Nik Stauskas, among others. By the time Wisconsin tips off against Michigan, no detail will be left to chance, even if the Badgers’ execution of that plan is unusually poor in a rare 77-70 loss. "You can tell he knows exactly what he’s talking about when it comes to the other teams and our team and seeing the game," Badgers center Frank Kaminsky says. "Being that kind of detailed person has helped him. Just the little things in scouting reports that he points out about players that maybe other teams don’t notice. But we take it away, and it saves us points during games." Wisconsin guard Josh Gasser calls Gard, in his 13th year with the Badgers, "the glue to this whole program" because of all he does during the year. He organizes Ryan’s summer camps, sets up the team’s nonconference schedule, scouts opposing teams, meticulously prepares players before games and relentlessly recruits the state of Minnesota. He has brought in key players such as Jon Leuer, Jordan Taylor, Jared Berggren and Mike Bruesewitz in recent years. And on Monday and Tuesday this week, Gard was gone again on the recruiting trail. "We almost have two head coaches in coach Ryan and coach Gard," Gasser says. "He’s got that head coach mentality, that moxie about him. And that’s perfect to have." Badgers forward Sam Dekker, the team’s best player and a potential future NBA lottery pick, says Gard never stops finding ways to better the team. Two weeks ago, after a scouting report, Gard pulled Dekker aside to tell him to take more notes off recent game tapes in scout sessions. If you don’t have as many mistakes on film during a game, Gard told him, log mistakes your teammates make. "Say Frank or Josh goes up with a weak shot, he said, ‘Hey, write that down so you don’t have to do that,’" Dekker said. "You can remember, go in there, jump stop, pump fake, get them in the air and then finish. If someone turns it over, remember don’t leave your feet on a pass. Those little things. Every mistake that a guy makes on the floor, you’ve made in your life. He just wants you to remember to stay disciplined, play the way that we’re taught to play. "I take lessons from him very seriously because he knows what it takes to win. A guy that’s so detail oriented is someone that you can easily listen to because he knows exactly what he’s talking about. He’s been around the game a lot longer than I have, so I can always take words of wisdom from him." As Dekker spoke following practice, Gard was on the Kohl Center court in the background. He was playing defense and teaching his 10-year-old son, Isaac, the art of the shot fake and dribble drive on a close out. The inevitable question arrives, and Gard is ready with a response. Sort of. The premise of the question: Shouldn’t an assistant coach with as much success and experience as Gard be ready to take a head coaching job soon? For starters, Gard recognizes he has a good thing going. Wisconsin is 16-2, ranked No. 9 in the country, has become a perennial top-25 program and has never finished worse than fourth in the Big Ten under Ryan. Good players are a big reason. But so is good coaching. Nearly six years ago, Gard was promoted to associate head coach. And Ryan offers his assistants the liberty to explore all facets of the game. "I talk to other assistants at other schools, how they have to punch the clock and have to stay until the last coach goes home," Gard says. "He gives us a lot of freedom to go on the road, recruit, fill him in on what’s going on with recruits. Be able to cut out when you can to go see your kids." Gard, 43, is married to wife Michelle, and has three children — Mackenzie (12), Isaac (10) and Peyton (5) — whose grandparents are all within four hours driving distance. He loves the state of Wisconsin and its signature college basketball program. His office wall represents a tribute to the Badgers’ successes, with so many framed newspaper clippings hanging that he’s run out of room. The past two seasons worth of framed newspaper highlights are stacked in a corner near the entrance to his office. Still, the time will come when the second-longest tenured Big Ten assistant will need to make a decision on his coaching future and consider parting ways with Ryan to run his own team. Some programs, in fact, already have tried to lure him away. Toledo expressed interest in hiring Gard in 2008, and Army followed suit in 2009. Gard was a finalist for the Green Bay coaching job back in 2010. It went to Brian Wardle, who was an assistant there at the time. "He’s had opportunities," Ryan says. "He’s picking the right spot. And he’s earned it. You show me an assistant that has that kind of record. He’s earned the right to pick his spot." Greg’s brother, Jeff, now the head basketball coach at UW-Platteville, says he admires Greg for sticking with the program, not bolting at the first sign of a head coaching position. In several instances, other programs Gard could have considered have not performed well and instead have "gone another direction," Jeff says. Maybe, he figures, his brother was meant to stay at Wisconsin for something greater out there. During 13 years in the Big Ten, Gard has earned praise across the league from coaches, who agree he’s put himself in position to achieve the ultimate coaching prize. "I do think he’s one of the better assistant coaches, not in the Big Ten, but in the country," Michigan State coach Tom Izzo says. "I think he works his tail off. I was with him a couple times last year where he had driven forever to get to places. He has been pretty loyal as an assistant there. "I have the utmost respect for him. I think he’s one of the guys that’ll be in the chair that I’m sitting in some day soon. He’s going to be a head coach. There’s no question in my mind." In the meantime, Gard will continue to preach the same values he learned all those years ago on the hog farm. Pay attention to detail. Keep chipping away today, and try to be a little better tomorrow. The rest, eventually, will fall into place. "Do I want to be a head coach? Absolutely," Gard says. "Am I ready for it? No doubt in my mind. But you also get to a point where you understand that there’s a lot more that’s tied into this than just what your title is. "I don’t know where this is going to take me. Wherever it does, if there’s a great situation and it’s the right fit, great. If not, we’re going to keep building this program and be really good down the road. It’s hard to give an answer to the question of what’s going to happen because who knows?" If and when the right head coaching opportunity presents itself, Gard certainly will be prepared with a detailed plan for success. Given what he’s demonstrated over two decades in coaching, there’s one question with an easy answer.